This film, The Lamb of God, put out by the Mormon Church, is one of their witnessing tools. The film is about 30 minutes long and starts with Christ's prayer in the garden of Gethsemane, and ends with His resurrection. This film has excellent cinematography, reasonably good acting, and was, for the most part, biblically accurate. However, there were a few notable weaknesses in the film. The viewer was disappointed from the lack of suffering depicted by Christ. After being flogged, whipped, and beaten, He hardly had any scratches on Him. It just did not seem realistic. The voices of the actors did not seem realistic either because their voices where dubbed over. Christ had a very notable booming voice no matter where he stood in relation to the camera, and it sounded exactly like the Jesus statue in the Temple Square Visitors' Center. Another notable thing was that everything was in the King James language, which is not all that surprising coming from the LDS Church, but it really made the film feel antiquated--as antiquated as the early 17th century when the King James Version arrived on the scene. The movie did have great music, but could not overcome the film's lack of convicting power. At the end of the film, there is an advertisement for the Bible, and its companion, the Book of Mormon. This is an attempt to raise questions about The Church of Jesus Christ of Latter-day Saints and its scriptures. If you are not familiar with the Mormon Church, this film may lead you to believe that it believes in the same gospel as mainstream Christianity. There are not enough distinguishable features in the film to make you aware of the overwhelming differences between Mormonism and Christianity. Take, for instance, the person of Christ. The film depicted a generic Christ and gospel that mainstream Christians would feel comfortable accepting (e.g., that Christ died and rose again, and that we should believe in Him). That is where the danger lies. Unless the Christian is aware of the teachings of the Mormon Church, one can easy to fall into its trap of disguise. The Mormon Church is reluctant to immediately share with you that it teaches that Christ is simply a literal brother of ours whose spirit was begotten by Heavenly Father and Heavenly Mother in a pre-earth life, and whose flesh was begotten by the union (many think sexual) between Heavenly Father and Mary (who was also begotten by this Heavenly Father as Jesus was). For other differences between Mormonism and Christianity, see Seven Differences between Mormonism and Christianity. Overall, this film was not very convicting and was too short to offer any real substance. It does not set itself apart as a great film on the crucifixion of Christ. It's enjoyable to view as far as its cinematography is concerned, but still lacks the convictional punch that the crucifixion of Christ deserves, especially after watching Mel Gibson's The Passion of the Christ. 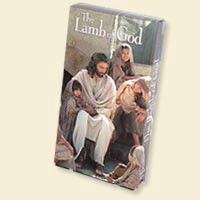 To order a free video of The Lamb of God, call 1-800-788-3800 or see here.